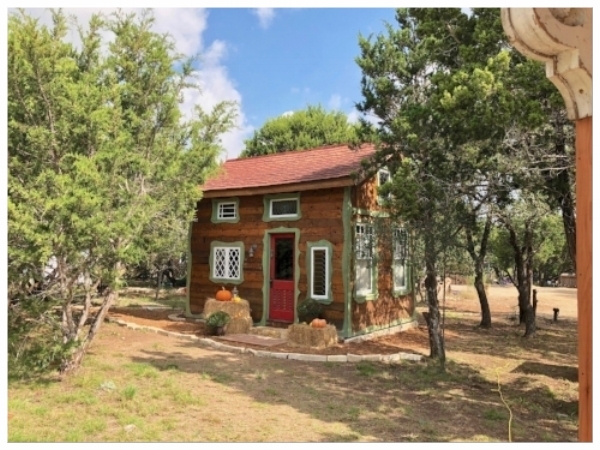 This little storybook cottage is tucked into the cedar and oak trees, surrounded by birdsong and deer in the wee hours of the morning, and the chirp of crickets and frogs as dusk blankets the hills. Robin Hood's Hideout is the first of 12 cottages planned for Havenwald. Robin Hood's Hideout is built mostly from salvaged and vintage materials. The wood came from up north, some of the stained glass windows came from as far away as England. If you peek at the hinges when the windows or doors are open, you'll see beautiful relief patterns in the bronze, from an era long gone. We like to imagine that perhaps Robin Hood and Maid Marian may have ducked the paparazzi and shared a few stolen moments here. Maybe Robin's Band of Merry Men escaped the wrath of the Sheriff of Nottingham by hiding out in this little cottage...or one very much like it. The window in sweet little dormer on the roof opens from the loft. Just inside the front door, you'll find a drawing of The Major Oak where Robin is said to have hidden inside the massive trunk. It still stands today in Sherwood Forest, Nottinghamshire, England. 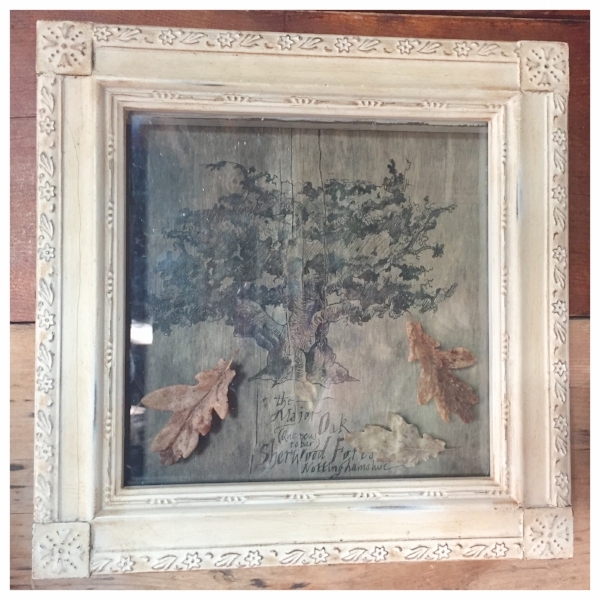 Our artist friend who hails from just near there, gathered the leaves from the foot of the tree and brought them across the pond to be framed with his drawing. The Major Oak, ink on wood with authentic Major Oak leaves. 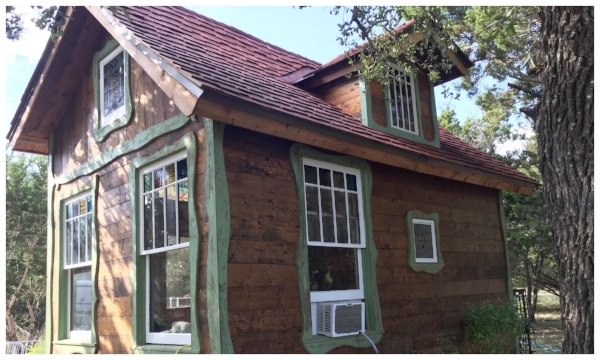 The cottage is under 300 square feet including the loft, which is tall enough for most to stand at the highest point. The roof is swaled and covered in cedar shingle, tall enough to allow for standing in the loft. The loft bed is full size, in a custom cedar frame. The 10 steps up the circular stairs are a traditional height, with a sturdy, cedar hand rail to guide you. 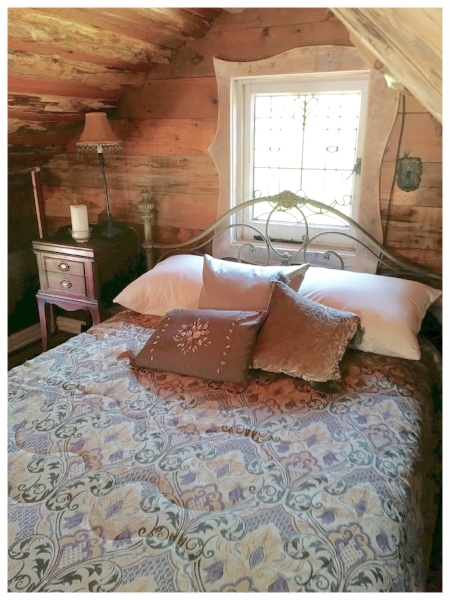 A cozy bed awaits weary travelers in the loft. The furnishings are nearly all vintage and antique treasures with a medieval flair, curated just for Robin Hood's Hideout. Every goblet, glass or piece of pottery had to pass the medieval design test, before it could live in Robin Hood's Hideout. Modern inventions like plumbing, insulation and air conditioning have been included to ensure your stay is a bit more comfortable than when Robin passed through. But then, any cottage had to be more cozy than the trunk of a tree! 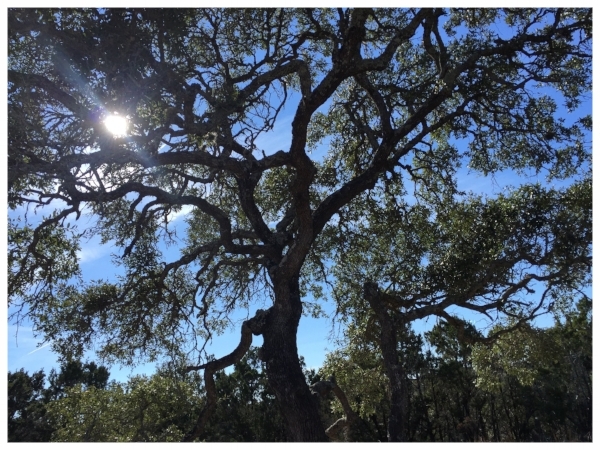 Just one of the many trees that grace the land at Havenwald. Please follow this link to our listing on AirBnB to book your stay at Havenwald.